MyDigitalSSD makes it easier than ever to take your favorite Apps, Games, Music, Photos, Documents, or entire OS on-the-go with the OTG V2 pocket SSD. / Optimized to reach incredible data transfer speeds up to 465MB/s read and 445MB/s write in USAP-enabled devices, users can run operating systems, programs, games, media, and more directly from the OTG V2 anytime, anywhere. / The smoothly redesigned OTG V2 fits in the palm of your hand, measuring slightly smaller than a business card and weighing less than 1 ounce, making it an ideal perfect travel companion for even when you’re packing light. / Please note, the OTG V2 pocket SSD is not crushproof or waterproof. / Not only is the OTG V2 up to 4X faster than comparable spinning hard drives, it also utilizes SSD technology to better protect your data. With no moving parts that can wear down over time, the OTG V2 eliminates your risk of data loss during the day-to-day bumps, shakes and drops that come with on-the-go computing. / OTG V2 drives have been have been over provisioned to help provide consistent random read/write performance and IOPS, extended performance endurance to minimize sluggishness as the drive fills with data, prolonged drive life, reliability, and low power consumption. 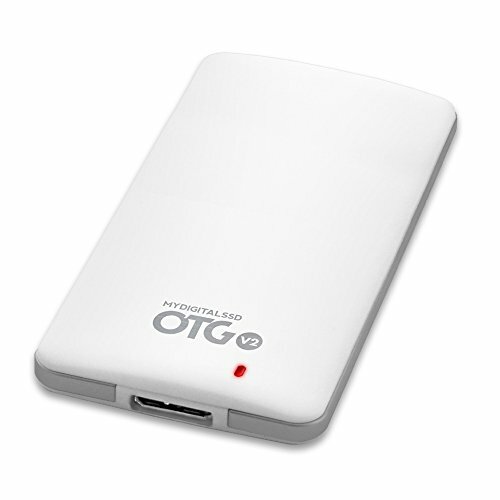 / The OTG V2 is your storage gateway between devices, offering plug-and-play capability in PC or Mac and full compatibility with USB specifications - USB 1.1, USB 2.0, and USB 3.1 Gen 1 (USB 3.0). / Additionally, each OTG V2 includes two USB cables: One 8-inch USB 3.0 cable for use in standard USB ports and one 18-inch USB Type-C cable for use in USB-C compatible smartphones, tablets, and laptops.